A high quality fusing kilns is essential for professional artists. Every Nabertherm fusing kiln is equipped with state of the art technology like energy saving insulation or fast switching solid state relays for most accurate temperature cycles. High power rating allows fast cycle times with every standard fusing kiln. A stainless steel dual shell housing guarantees low shell temperatures and a long service life. Every fusing kiln is insulated with a non-classified AES fiber material. With top temperatures of up to 950°C you can do also combing in a Nabertherm fusing kiln. The very good temperature uniformity guarantees excellent results for glass fusing, slumping or bending or even glass painting. The standard fusing kiln model with table sizes of 50 x 50 cm or even up to 120 x 80cm is available within a short time. 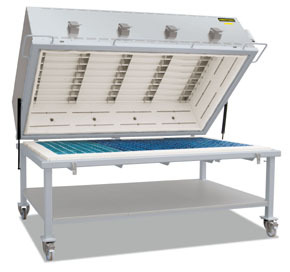 Nabertherm manufactures also a fusing kiln with table sizes up to 250 x 150 cm as standard size. Our engineering department with more than 40 engineers would be able to design also a customized kiln. Nabertherm manufactures kilns for Arts & Crafts since 1947. We deliver also today spare parts for old kilns within a short time for fair prices. Nabertherm offers a wide range of standard kilns/furnaces and plants for many different areas of application. The modular design of our products means it is possible to find a solution in many areas to your particular problem without the necessity of costly conversion and modification. And, if none of our standard kilns or furnaces meets your requirements, then we will gladly develop a kiln, furnace or complete plant specially tailor-made to your needs.